Partick Thistle boss Alan Archibald has been named Ladbrokes Premiership Manager of the Month after overseeing a complete turnaround in fortunes at Firhill Stadium. The Jags had started the season in desperate form, drawing three and losing seven of their first 10 games in all competitions. However, a 3-0 win over Dundee United at the start of October proved the catalyst and Thistle have now lost just one of their last seven games, claiming seven of the nine points available to them in November. The team that ran out 5-2 winners over Kilmarnock last weekend was in stark contrast to the one that failed to score in 278 minutes of competitive football at the start of the campaign and Archibald puts the new-found form down to confidence and a slice of luck. “Getting that first victory against Dundee United gave us a huge confidence boost. We’re also getting a slice of luck now that we weren’t getting before as we saw with the goal against Inverness,” he told Ladbrokes News. 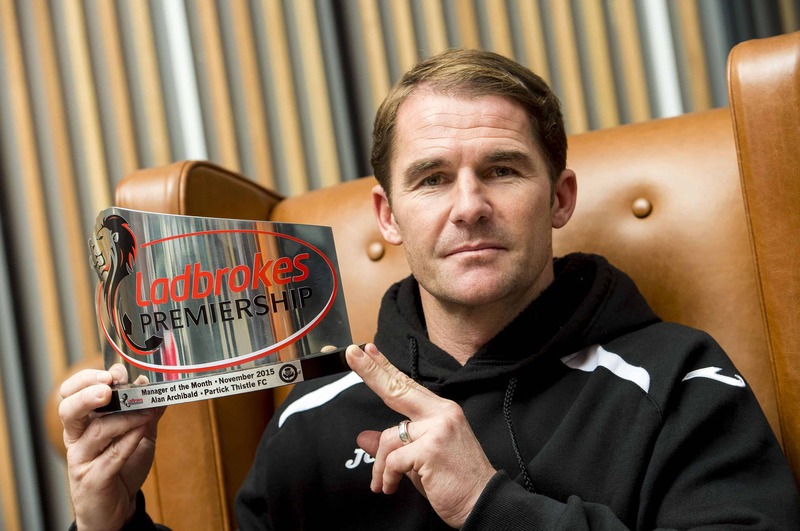 Partick Thistle manager Alan Archibald is awarded Ladbrokes Premiership Manager of the Month for November. The Jags gaffer insists that he and his staff have urged the team to stick to their basic principles to get them through a rough patch, but also admits that time has been spent focussing on getting the ball into the back of the net. “We try to play the game in the right manner and have stuck to that but we also tweaked a few things with a view to scoring goals. We needed to address that and now we are scoring goals from other areas and lightening the load on the strikers,” he added. Partick are now nine points clear of bottom side Dundee United and just five points off the top six. However, with the visit of 11th-placed Motherwell to come this weekend Archibald is not getting carried away. “We are looking upwards but we can’t get away from the fact that one defeat, especially this weekend, could see the table change. We have a great incentive to beat Motherwell and hopefully we can increase the gap,” he explained.